As you probably know, the Eagle & Badge Foundation was created by the Los Angles Police Protective League 12 years ago to help police officers’ families in times of need, as well as children in the communities served by LAPD officers. Each year in the fall, we present the Eagle & Badge Gala, our major fundraising event of the year for this foundation. Our 2013 gala is shaping up to be one of the best. Our esteemed honorees are all major supporters of law enforcement and public safety, and believe in working together to achieve their goals and make the community a better place. 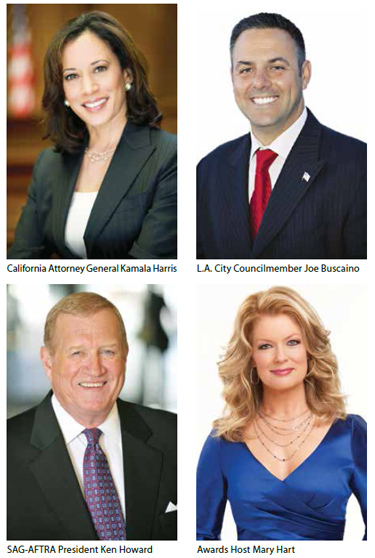 We are proud to honor California’s Attorney General, the Honorable Kamala Harris; Los Angeles City Councilmember Joe Buscaino; and the president of the newly formed SAG/AFTRA, veteran actor Ken Howard. All three individuals have shown outstanding leadership in their fields and are proof that teamwork can make a difference. This year’s “In the Line of Duty” Awards will be held Saturday evening, Nov. 16, at the JW Marriott Hotel Los Angeles, in the heart of L.A. Live. Hosted by the beautiful and talentedMary Hart, we promise a great evening of camaraderie, gourmet food, silent and live auctions, headline entertainment and a few surprises. FedEx fast-talking pitchman and actor John Moschitta will host our live auction, so we hope you’ll encourage your friends to support our gala and bring their checkbooks. The Honorable Mayor Eric Garcetti is serving as our honorary event chair, and LAPD Chief Charlie Beck and Steve Soboroff, president of the Los Angeles Police Commission, are serving as honorary co-chairs. I am pleased to serve as executive chairman of this event, and I thank our Eagle & Badge board members for their support in making this another outstanding event. We anticipate over 1,000 members from the entertainment, political and law enforcement community to be on hand again this year. Last year’s event allowed us to provide over 35 grants to LAPD officers, and community and policebased organizations, which in turn have helped many thousands of individuals, most of them children. This past year we have seen more than a 200-percent increase in requests for financial support from officers who need our assistance, including another specially trained service dog for an autistic child of an LAPD officer; a flight for an officer to attend his father’s funeral; payment for an officer’s family to fly in to be with their son during his remaining weeks of life due to cancer; and recent cases of extenuating circumstances for officers with cancer, brain tumors and several other life-threatening illnesses. The Eagle & Badge is an organization founded to provide this support for you — as the officers who protect and serve all of us, we are honored to be there for you in your time of need. We are gratified to know that our efforts help your families. For more info on the Eagle & Badge Gala, please contact me at (213) 792-1086 or email me at PeterRepovich@lappl.org.